ABOVE: Oceania's Regatta is moored at Langelinie as Silversea's Silver Whisper departs for Edinburgh. Shops occupy the old stone warehouses that face the wharf. Copenhagen's popularity as a cruise port has grown enormously in the last few years, with more than 500 cruises and half a million passengers visiting the city in 2008. If you've got an hour or two to kill before departure, or if you'd rather not haul purchases from the city center to the ship, allow time for a visit to the Langelinie Quay Shopping Arcade. Beneath the stone arches of Langelinie's old warehouses, you'll find shops that sell porcelain, amber, Danish clogs, jewelry, clothing, and other products. 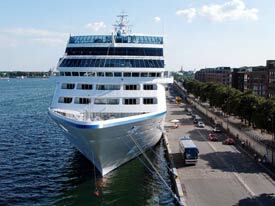 This English-language Web site has useful information for cruise passengers, including a FAQ. See the Cruise Terminals page for advice on how to reach the piers from Copenhagen's airport and central railroad station.